Chris treated us to a demonstration of the capabilities of just some of the huge range of tools produced by Robert Sorby (http://www.robert-sorby.co.uk/ ). Sorby claim to be the world’s premier manufacturer of specialist wood working tools with a heritage dating back over two hundred years. Most of their tools are still made in Britain, how rare is that these days? There are the traditional gouges, chisels and scrapers and I suppose most of us have got a few of them in our workshops. Then there are the more innovative ones and naturally it was these that Chris concentrated on. 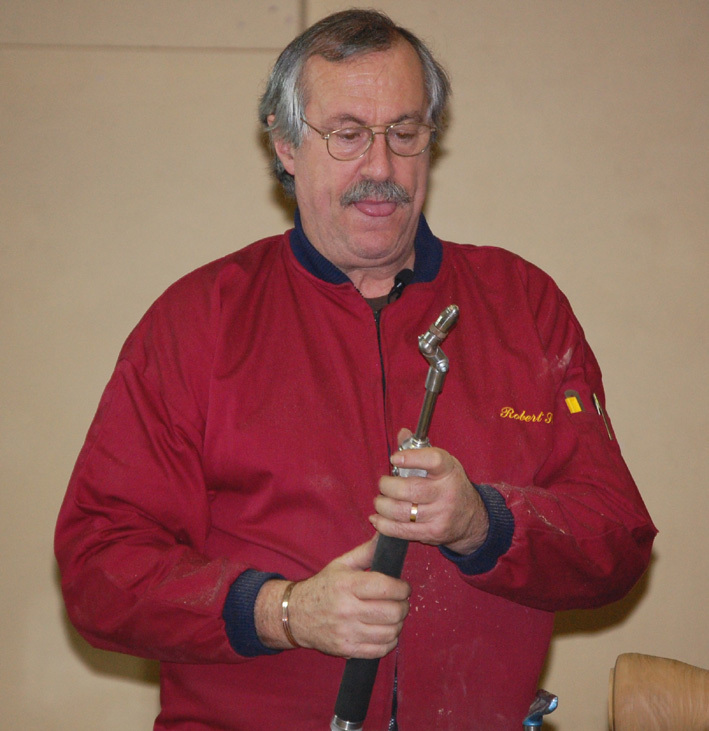 Chris started with the “Spindle Master” which seems to be a cross between a skew chisel and a round nosed scraper. As its name implies, it is designed primarily for spindle work and is claimed to be easier to use than a skew and is capable of giving a fine finish. Certainly it seemed to work well in Chris’s hands though I guess he can use a normal skew pretty well anyway! He then moved on to hollowing. The sheer scraper system has removable, adjustable tips for scraping plus a hollowing tip. It is advisable to keep the tip in line with the tool bar as far as possible to minimise the risk of it twisting. However, the bar has a D shaped cross section and is used with the flat side on the rest when using the hollowing tip. For significant undercutting, a swan neck bar can be used. Of course these are scraping systems but Sorby now also make a shielded ring hollowing cutting tool called the “Ultima”, Clever. This has a lot in common with the Monro tool but the gap between the shield and the cutting disc which determines the depth of cut is adjustable by means of a ring. As a Monro user this seems like a good idea as it is one of the few things I find tricky to set up. –Ed. It’s no good having nice tools if they are poorly sharpened. Sorby make a belt sharpener called the “ProEdge” which has various jigs for consistent shaping. The tool edges certainly looked good and the grind is flat not curved or hollow as you get from a wheel. This looked very nice but much dearer than a conventional grinder. Sorby are well known for their texturing tools and Chris showed the old texturing tool as well as the newer spiralling tool. The latter in particular is capable of giving some very nice effects once it has been mastered. 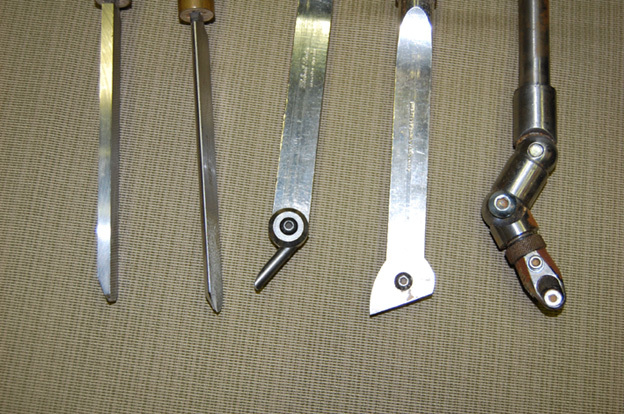 The picture shows some of the tools demonstrated. From the left they are the “hardwood scraper”, “spindle master”, sheer scraper with hollowing tip, sheer scraper with scraper tip, the “Ultima” hollowing tool. Chris closed with a brief look at the member’s gallery. All the pictures are on the website. Though he thought the standard was good, the gallery equated to only a small proportion of members work.